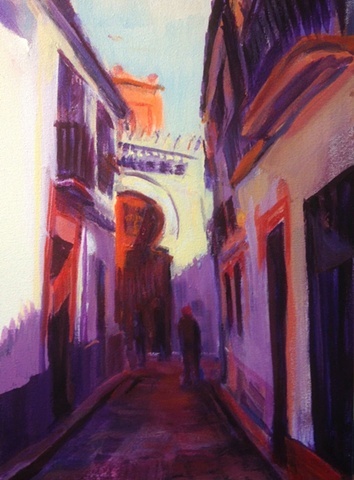 A dramatically lit street scene in the Jewish Quarter of Cordoba, Spain. Ancient, Islamic architecture bathed in light and surrounded by shadowed, narrow streets create this intimate, exotic landscape. Again, another opportunity to evoke the play of light and shadow. Spain's ancient Moorish architecture, history and lingering influences remains intriguing and fascinating. If any of that is of interest to you I recommend Tales of the Alhambra, by Washington Irving.